Like a futuristic castle for car geeks, the Clemson University International Center for Automotive Research sits overlooking Interstate 85 with an edifice that’s all silvery surfaces, sharp angles and glass that gleams in the South Carolina sun. Inside CU-ICAR, something equally dazzling is going on. Drawn from each successive class of the two-year graduate automotive engineering program, a team of students starts with nothing but an idea, and ends up with a stunning, road-worthy vehicle. The program is called Deep Orange – because it’s a deep dive into the auto engineering process and because, well, everything connected to Clemson is orange. “It’s a fantastic opportunity to learn about many different aspects of a vehicle, in a scale like they would in industry, but in an environment where everything is a learning experience,” says Chris Paredis, director of Deep Orange and the BMW endowed chair in systems integration. All engineering programs require a “capstone” design project of some sort, says Paredis, who previously held faculty positions at Carnegie Mellon University and Georgia Tech. Some have students design and build a vehicle, typically as part of a competition. A reinvention of the Mini – in partnership with the BMW Group in Munich, Germany – aimed at maximizing space and providing a fun driving experience. Some of the sleek prototype vehicles are on display at CU-ICAR’s Greenville campus, tangible reminders of what Deep Orange collaborations can achieve. Links between Deep Orange and its automotive industry sponsors reflect synergy that’s been essential to CU-ICAR since its founding in 2007. Some 67 percent of the research done on its campus is industry-sponsored. Streamlining manufacturing, coping with weight limits, moving toward hybrids, using robotics, the autonomous trend…if it’s important to the auto industry, there’s a multidisciplinary team at ICAR working on it. “There has to be a value proposition for industry,” says Rigas, who believes the most important value is access to ICAR’s best and brightest grads. The university says 95 percent of ICAR students snag jobs in the auto industry. 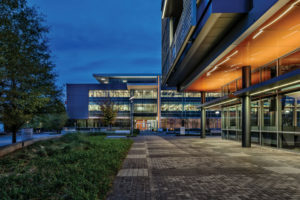 Beyond that, the center’s focus on systems integration brings a diverse mix of specialists – in engineering, design, even psychology – into the problem-solving process. That’s vital, Paredis says, because there are so many aspects to modern car design and engineering, no one specialist can master them all. And beyond that, there are benefits for the burgeoning automotive supply chains along the multistate I-85 corridor, and for the whole state. According to the South Carolina Department of Commerce, the automotive industry has quadrupled in size in the state during the last 20 years, with more than 400 automotive-related companies and 66,000 people in the automotive workforce. BMW, with its North American manufacturing facility in the upstate, was the first, in 1994; Volvo, with its lowcountry plant that will produce only hybrid and electric vehicles, is the most recent. CU-ICAR was founded in 2007 and nearly 70% of its research is sponsored by industry. As with any academic environment – an “innovation ecosystem,” as they say – the 250-acre, $250 million CU-ICAR campus is a complicated place. Don’t look for Dabo Swinney and the football stadium; they’re about 30 minutes west at the main Clemson campus. Top-level ICAR faculty include four endowed chairs and an endowed professorship. About 1,300 people are on site during the academic year. More than 20 companies also maintain a presence on campus. From the soundproof port where students listen for the slightest potential road noise, to the areas where Deep Orange teams do their machining and assembly, everything is state-of-the-art. Just as important to CU-ICAR students is their multidisciplinary approach, according to Paredis. For the Deep Orange projects, a team of 20 to 40 students must tackle a challenge that’s about more than design and engineering. They think about who’d want to drive the vehicle and how it would be marketed. They work out testing scenarios. Societal and transportation trends must be considered too, Paredis says. For example: How should a vehicle that’s used in a ride-sharing system differ from a vehicle that just one person will drive? In essence, Paredis says, the Deep Orange experience is like working for an automotive manufacturer and cycling through every process, in every department, from conception to completion of a vehicle. “But if you tried to have a similar experience in industry, it would take a long time,” he says. Rigas took over leadership of CU-ICAR with an eclectic resume in business and academia – he’s not just an auto industry guy. As South Carolina revels in its automotive resources, but looks to broaden its industrial base, there’s been speculation CU-ICAR might be headed down a different road, less focused on automotive issues. 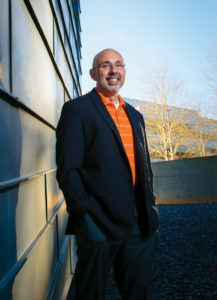 Clemson’s new Center for Advanced Manufacturing certainly is aiming at broader targets. But Rigas sees outreach to other industries not as a different road, but a parallel path that will benefit everyone. “A lot of the technologies that are important to the auto industry are also important to other industries as well,” he says. He mentioned Samsung, which announced plans for a $380 million home appliance manufacturing plant in Newberry in June 2017 and already is producing washing machines with technology that includes robotics. Automotive manufacturers are interested in forging connections with other industries, Rigas says. Clemson students also benefit from interactions with other industries, he says, as they learn how to tackle different types of challenges. Gregory Wheeler isn’t one of the ICAR grads snapped up by industry — he earned his master’s and returned to his job as an Army infantry commander at Fort Benning, Georgia. But who knows? Given the Army’s involvement in automotive research, he might transition eventually to work in that field. Meanwhile, he takes pride in his leadership role on Deep Orange 9, the rally car project. He earned a mechanical engineering degree at West Point, and grew up working on cars with his dad in central Illinois. But for many on the rally car team, hands-on experience was something new. Challenges in the rally car project included planning for rough terrain, competitive conditions and unusual safety measures. The multidisciplinary Deep Orange experience – considering marketing strategies, for instance – also should serve students well in automotive careers, Wheeler says.